On November 4, 1979, a group of Iranian protesters and militants stormed the U.S. embassy in Tehran. Still filled with the revolutionary fervor that toppled the regime of the Iranian monarchy that spring, they sought to make a statement against the influence of the country where the exiled, ailing Shah had taken up residence, the country that helped put him into power, and ousted a democratically elected government in 1953. In the process, the statement got bigger. Rather than simply occupying the embassy for a while and departing, the protesters took 52 hostages and held them with the approval of the country’s new leader, Ayatollah Khomeini. Six others, however, got away, eventually finding their way back to America through an unlikely route. Ben Affleck’s third directorial project, Argo, recounts their odd escape, made possible by the efforts of a CIA agent (Affleck) with Hollywood connections and an inspired notion about how to put them to work: create a phony science-fiction film named Argo as a cover story, travel to Iran as a producer scouting for locations, and return with the Americans in tow disguised as a Canadian film crew. Working with a CIA superior played by Breaking Bad’s Bryan Cranston, he sells it as the “best bad idea” for the problem. Then with the help of a veteran special-effects artist (John Goodman) and a grizzled producer coming to understand his best years are behind him (Alan Arkin), Affleck puts the plan in motion, proceeding with the determination of a man who doesn’t see any course but the absurd one he just dreamed up. 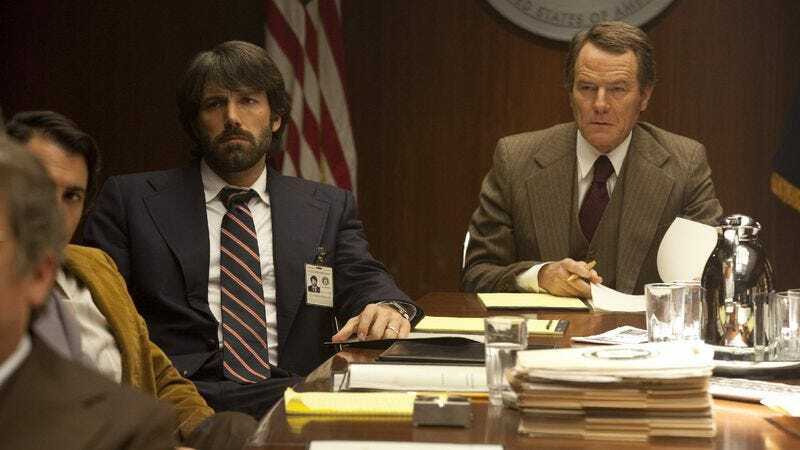 Drawing on a Wired article by Joshua Bearman, Argo follows that plan from conception to execution, a process that takes Affleck’s character from Washington to Hollywood to Tehran, and watches as he navigates each world while drawing on a seemingly bottomless reservoir of confidence. Though it may seem ill-considered for Affleck the director to cast Affleck the actor as the coolest, smartest guy in any room, his performance never sounds a note of vanity. His protagonist succeeds by owning and controlling any given situation, but he carries himself like he understands the stakes at play. The look in his eye suggests he’s learned to fool everyone but himself. The film glides skillfully from the perilous front lines of international espionage to the lower reaches of show business and back again, quietly drawing parallels between worlds in which appearances are everything. In one memorable scene, Arkin lies and bullies his way into optioning a script at a low price while Affleck observes quietly, possibly picking up some tricks. Later, they build heat for their never-to-be film—a plausible project in the post-Star Wars moment when seemingly anything with lasers and hyperspace could get green-lighted—through hype and suggestion. And as the men get to know each other, Affleck finds a parallel for his own troubled home life when Arkin talks about the family he never sees. One of them is in a more dangerous field than the other, but both have seen their happiness eroded by all-consuming professions. In spite of its disparate settings, Argo maintains a consistent tone by sustaining a sense of slow-mounting dread. The hostage crisis hangs in the air like a persistent haze throughout the film, dominating conversations and the nightly news. As the plan develops, so does a feeling of urgency, as the news out of Iran gets worse and the Canadian ambassador (Victor Garber) playing host to the Americans starts to feel Iranian suspicion turn his way. It’s consistent, too, in its focus on details. The opening scene restages the takeover of the embassy with journalistic scrupulousness, dramatizing the mounting intensity of the protests and the growing panic of those inside as they scramble first to dispose of classified documents, then just to protect themselves. Elsewhere, aided by cinematographer Rodrigo Prieto, Affleck favors long takes and walk-and-talk exposition-as-action scenes propulsive enough to make Aaron Sorkin envious. The film never stops moving, and it always moves purposefully, focusing, like its hero, on the task at hand. Only the finale threatens to undo all that hard work. Though well-done, the last act leans less on the facts of the case than on Hollywood contrivances, heightening the tension with embellishments that feel at odds with the methodical, deliberate film leading up to them. But that’s a 11th-hour flaw in an otherwise careful, involving film that turns one of recent history’s strangest footnotes into a gripping thriller made all the more effective by its emphasis on the human cost of global gamesmanship, and on the toll those games exact on those who play them.